Ningbo Trueline Decorative Materials Co., Ltd is professionally dealing with the production and sales of building materials since 2001. We have aluminium composite panel and various kinds of decoration materials, such as ceiling board, PVC board, gypsum board, mineral board, PU sandwich panels, etc. We can also supply tools and accessories for installation of building and decoration materials. We have got ISO certificate and SGS. Our products are exported to Russia, Europe, South of America, Asia, Middle East and Southeast Asia. Alucopanel Aluminium Composite Panel is a new decorative material used ever increasingly by developers, designers and architects world wide for various applications. It consists of a thermoplastic compound core laminated between two sheets of aluminum. 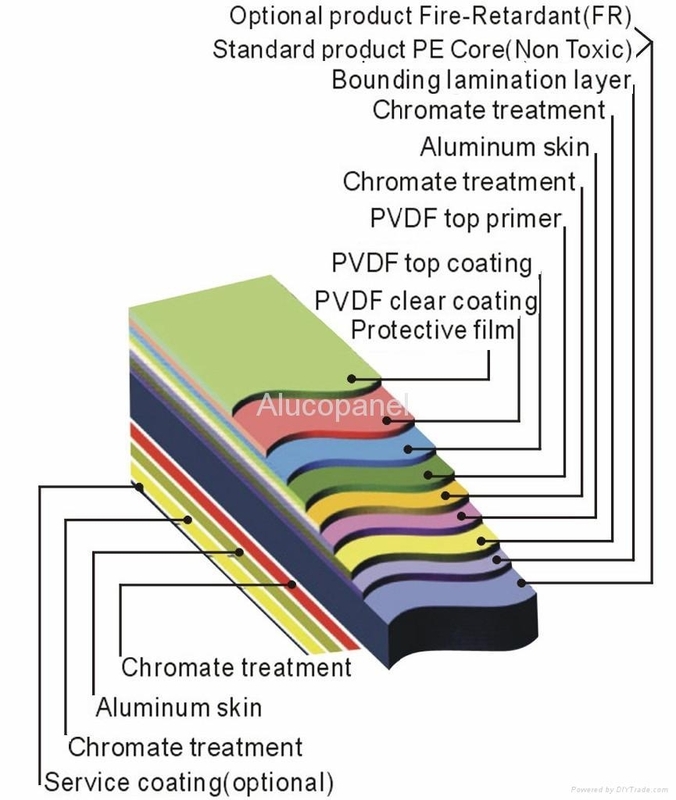 The Top Aluminium Sheet is coated with either Polyester or PVDF Paint. The Core is either Normal Polyethylene Based or a FR (Fire-Resistant) Core which is specially treated for fire resistance.The Bottom Aluminium Sheet comes in either Mill Finish or backside paint The finished panels provides the rigidity and strength of composite construction with excellent architectural flatness for creating smooth, monolithic, surfaces, exceptional load-bearing capacity and flexural strength. Aluminium Composite Panel also known to many as sandwich panel consists of a Polyethylene core sandwiched between two aluminum sheets. These Panels are very versatile and can be used in many applications. The entire panel consists of 3 main layers. Our Company keeps the policy “Technology-centered, Quality product & Best service to bring more benefits our customers”, aiming at the steadily sustainable development. Warmly welcome to contact us.